Catholic tradition meets Native American spirituality at Dakota Pipeline protest. I drive to the Dakota Access Pipeline (D.A.P.L.) protest in late November with a mix of mild apprehension and marvel. I am apprehensive over the chance of violence and arrest, and I marvel at the beauty of the Standing Rock Reservation’s vast, undulating prairie landscape. As I travel I begin receiving from this sacred land a felt infusion of spiritual spaciousness, a cleansing of soul clutter. As I top one of countless enfolding hillcrests along North Dakota highway 1806, the Oceti Sakowin camp suddenly appears ahead and to the right. It is breathtaking. Hundreds of beautiful tipis, tents, and square-framed structures nestle at the confluence of the Cannonball and Missouri Rivers, hugged by a ring of grassy buttes and covered by a majestic purple-blue sky. I can already see the pulse of camp activity. People are toting supplies, erecting shelters, tending fires, riding horses, talking and laughing. My spirit is galvanized, but edgy. I pull into the camp gate and up to a young Native American man standing at a security kiosk. I roll down my window and offer him what is surely a quizzical, uncertain face. He squats down, meets my eyes, smiles, and says, “Welcome home.” My apprehension and edginess immediately fall away. His disarming, familial welcome is arresting—not the kind of arrest I was anticipating. In clear, concrete and succinct language, men and women elders say what it means to call the land our home. The young man has learned well from his elders. 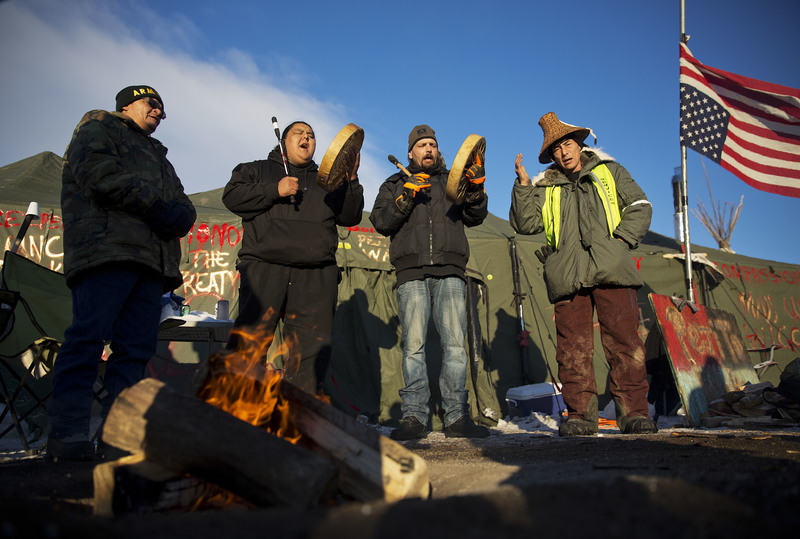 These teachers, some from the surrounding Sioux Nation and others from Native communities across North America, speak to camp residents at the Oceti Sakowin fire circle from early morning to late in the evening. Everyone is invited to prayer and ceremony, solemn time embedded in singing and a drumming heartbeat. In clear, concrete and succinct language, men and women elders say what it means to call the land our home. As I reach into my Catholic spirituality, seeking a way to link this lesson to my life in a compact neighborhood of bungalows on the South Side of Chicago, I am reminded that Pope Francis begins his encyclical “Laudato Si’” the same way: the Earth is our common home. The elders teach that within this home live all our relations: the two-leggeds, four leggeds, crawlers, winged ones, plants and rocks. Listen long enough and you will repeatedly hear the Lakota phrase Mitákuye Oyás’iŋ, or “all my relations.” I am yet more spiritually challenged by these teachings. What kind of conversion would it take for me to move from being politely warmed by the sentiment that horses and buttes are our brothers and sisters to truly seeing and feeling and living my life that way? Pope Francis resurfaces. Nothing in “Laudato Si’” is repeated more than “everything is connected.” He writes: “Because all creatures are connected, each must be cherished with love and respect, for all of us as living creatures are dependent on one another.” I’m beginning to feel that my time with the Native elders is opening me to buried riches within my own faith. No matter where you sleep in the Oceti Sakowin, Rosebud or Sacred Stonecamps, you will hear the 7:30 a.m. morning prayer through booming loudspeakers. This morning it is 18 degrees outside. I am debating whether to stay in my cozy sleeping bag or get up, go to the fire circle and pray with frozen toes. My sleeping bag is winning. But here is where my Catholic spirituality really kicks in, born as it was from my days as an altar boy walking in below-30-degree temperatures to 6 a.m. Mass. I grudgingly crawl out of the tent, walk to the fire circle and risk a low-grade hypothermia for God. The ceremony is beautiful. The high point is the Nibi Wabo Water Walk to the Cannonball River, led by chanting Ojibwe women from Minnesota, Wisconsin and Canada. During the procession to the river, the women chant Mni Wiconi, or “water is life.” We all repeat. The women then ask people from other tribes to chant the phrase in their language. About eight other Native languages intone “water is life.”' We repeat. Then a Jewish man from Brooklyn shouts, “Mayim l’chaim.” Native Americans from tribes across the continent begin enthusiastically chanting, “Mayim l’chaim.” Where else on Earth would a soul want to be? There is much to say about the Army Corps of Engineers’ recent decision to deny pipeline easement across the Missouri. It was a moment of communal elation I will never forget. And there is much to say about the D.A.P.L. protest and police brutality, corporate half-truths and government waffling. Further, Energy Transfer Partners, builders of the pipeline, has stated that regardless of the government’s decision, they fully expect the pipeline to be built along its current route. But in and among and even in spite of all this, the camps of the D.A.P.L. protest are places of spiritual education, challenge and growth. They are a worthy destination. How blessed we are to have Native American elders leading a courageous, spiritual defense of our land. How blessed we Catholics are to have the heart and words of Pope Francis to assist us in our journey with them. Oceti Sakowinhas forever marked my spirit, these strangers who welcomed me home. I believe this gathering at Standing Rock is a transformational moment. Beautiful reflection, Mike. Why are native Americans impoverished? -- they have no bona fide "property rights" to the land under their reservations -- you cant get a mortgage on a property which an individual is rightfully entitled to if they can't provide a bona fide incidence of ownership. Can't drill for natural gas, oil,soda ash or titanium dioxide if it "ain't y'rn". This branch of the Sioux has simultaneously decided that other folks property rights are not enforcible, and the liberal left.with "Little Big Man" on their minds, has thrown itself into their cause. Michael J. Schuck is a professor in the department of theology at Loyola University Chicago.